Okay, it's the end of week #4 challenge. Oh what a week. Things have been very busy but I finally finished a big project. I can't show the actual quilt before I can get it juried into a show, but I will give you just a small sample with a little picture. It has over 1,024 heat set crystals and many more crystals with fabric beads that are sewn on by hand. It turned out pretty well, I think. At least I'm happy enough with it. So we shall proceed on to week #5, without a clue as to what I'm going to pull out of my bag of tricks. Keep on keeping on and keep on quilting. So, this is the end of the third week of our challenge, and I'm still going strong. Making a personal challenge and having someone to participate with you makes it easier for you to keep your commitment. Plus, there is always that "one up" thing too. Congratulations to me for being a new member on "Pinterest". What an awesome site for ideas and tutorials and everything else it has. I'm just learning how to use it, but am enjoying it lots. 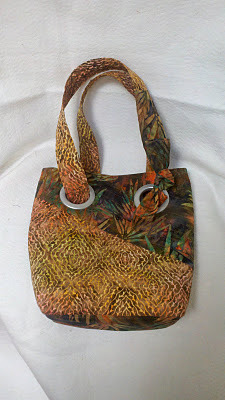 This week's project is from a women who is immensely talented. You can find her at mamiejanes.blog.com and I used one of her projects to reach my goal. I made pincushions from old cutter quilts and they are the cutest. I'm still working on my crystal quilts and had to purchase more crystals since I counted once again and there will be a total of 1,024 crystals on this quilt not to mention the crystals on the fabric beads. That's a lot of bling. I made a trip to "The Road to California" quilt show in Ontario, CA. and got to rub elbows with some of the well known quilt artists of today. Maybe one day I'll be one of those well known quilt artist but until then.....Keep on quilting. So, the second week of the challenge started off with a bang. I am certainly accomplishing plenty and having fun doing it. I have been working on a large quilt but it is not finished in time for this week's project, therefore, I submit the handbags that I made on Monday.The pattern is by Debbie Bowles of Maple Island Quilts Inc. and the pattern is named Wallet and Grommet. 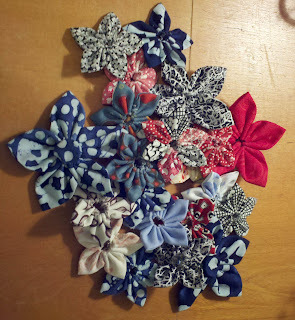 During the rest of the week, I made more fabric flowers (with the Kanzashi Flower Maker from Clover) and even taught a few of my friends how to make them. I think they really enjoyed it. So I am plotting, I mean planning my next week's projects. This is going to be fun! So it is the start of a new year and with that goes resolutions. Although I don't usually make resolutions, I'm going to start this year. I discussed with my oldest, and we decided to make " a project a week." So every week of the year I will finish a project and then blog about it. Wow, how did that first week blow by? I did happen do finish my project plus one. The first is a oven mitt. I bought the pattern, oh so many months ago, and decided I needed a quick project for the first week. 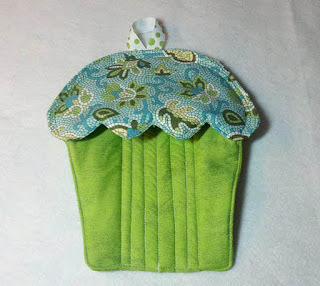 The pattern is by Susie C.Shore Designs and it's in the shape of a cupcake. The pattern was very cute. I wasn't loving my finished pot holder, so I forged ahead to my second project. The second project of the week, since the first was a quickie, was making fabric flowers. I had bought, once again, a while back, a "Kanzashi flower maker" by Clover. 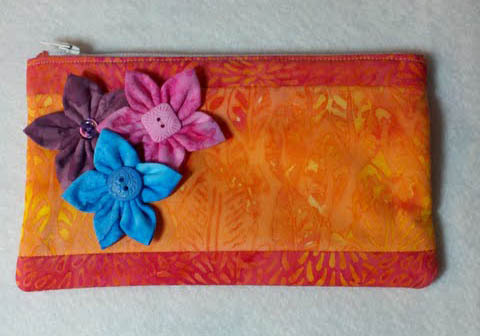 It's a little plastic thingie that folds in half and you hand stitch to make the petals. 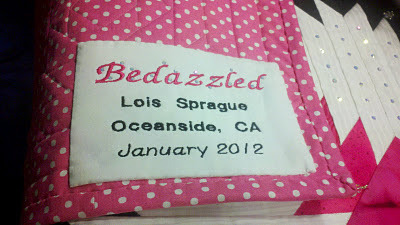 Now, for all that know me, hand stitching isn't my thing, but I digress.... 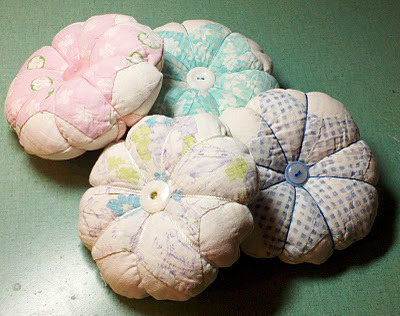 I had the most fun making these pretty little flowers, that I made several and attached them to a little bag that I had previously made. 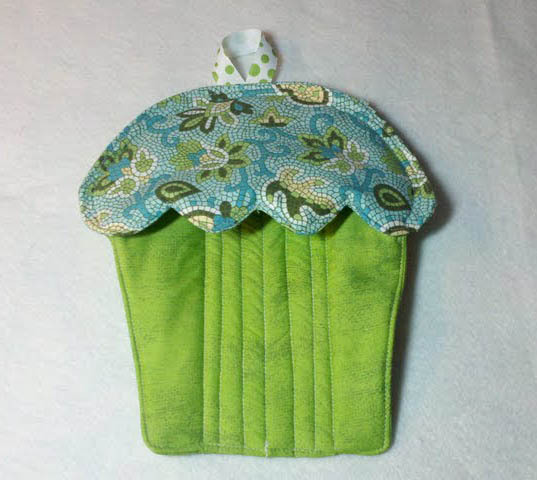 I think I will make a lot more of these and will check out the other designs that Clover offers. 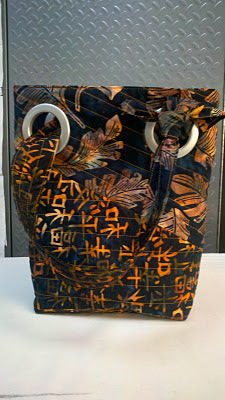 I have already picked out another pattern that I will be working on for next week and intend to finish sewing beads on a quilt and hopefully will finish that. I do believe this is going to be a good idea, and will certainly produce much if I continue.